NEW YORK - Nokia has today unveiled the Lumia 1020, as the battle for supremacy in the increasingly cut-throat smartphone photography arena intensifies. Nokia’s latest PureView creation carries a six-element Zeiss f/2.2 lens (including one glass element), and a 41MP, 1/1.5in-type, back-side illuminated imaging sensor. The lens module contains more than 100 parts. The glass element is of a ‘very high index’ to help minimise the height of the phone, said Eero Salmelin, head of Imaging for Nokia Smart Devices who added that the Lumia 1020 delivers the 35mm viewing angle equivalent of a 25mm lens. 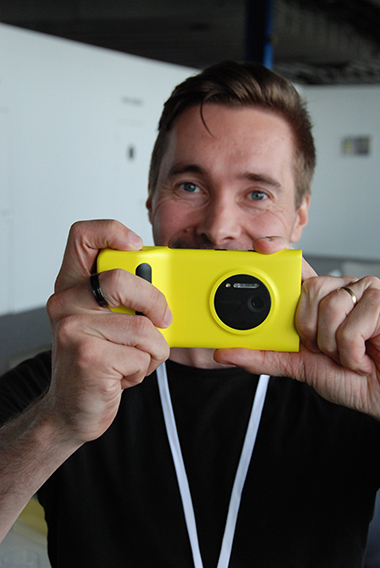 The Lumia 1020 deploys a mechanical shutter, while manual focus is possible using the Nokia Pro application. 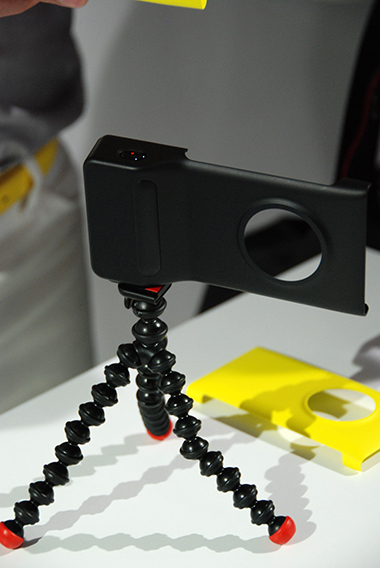 A ‘snap-on’ camera grip accessory (pictured below) features additional shutter control and is claimed to boost battery life. 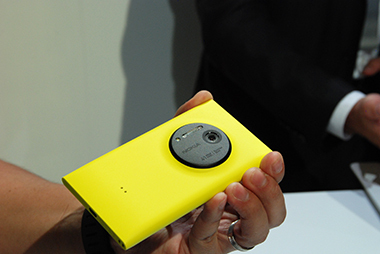 The Lumia 1020 is designed to capture 34MP and 38MP files in 16×9 or 4×3 formats, plus a 5MP at the same time. It uses Nokia’s existing ‘oversampling’ technology to combine seven megapixels into a single ‘superpixel’. Image stabilisation has been improved and colour technology revamped without making images look ‘artificial’, claims Nokia. Its Xenon flash boasts a sync speed of 1/500sec. Salmelin said Nokia chose not to add a memory card slot to the new cameraphone as this would take up more space, which was a ‘design issue’. It includes 32GB of internal memory. While, he is not expecting the 1020 to replace a professional photographer’s DSLR anytime soon, he hopes it will find its way into their gadget bag as a highly portable, spare camera. Nokia tells Amateur Photographer that the photography functions built into its latest camera phone come on the back of more than a decade of regular consumer surveys that it carries out with universities in its home nation, Finland. In the US the 1020 will cost $299.99 under contract, from later this month, and will be out in selected European countries ‘this quarter’. AP understands that it should be available in the UK in September, at a price yet to be announced. The Lumia 1020, whose name was leaked after an apparent blunder by a Microsoft official on his Flickr account, uses a Windows 8 operating system, in contrast to the Symbian-based PureView 808 phone that was announced last year. In auto mode, the firm is confident that its new ‘ball-bearing’-loaded image stabilisation system can prevent camera shake at shutter speeds as long as 1/3 second, according to its head of Imaging Technologies, Juha Alakarhu, in an interview this afternoon. When asked whether Nokia would consider adding a raw file mode, Alakarhu replied that this was ‘not impossible’. Though he stressed that there are no plans to add this feature to future models. Photography is becoming a key area for smartphone makers in a market where consumers are turning away from conventional low to mid-range digital compact cameras. For example, Samsung recently installed a 10x optical zoom on its latest smartphone, the Galaxy S4 Zoom. Billed as a high-end compact combined with a smartphone, the S4 Zoom features a 16-million-pixel CMOS imaging sensor, image stabilisation, plus a 4.3in AMOLED display. It seems camera makers are fighting back, however. Last week, Nikon’s boss was reported to be considering the development of a ‘non-camera consumer product’, as smartphones increasingly threaten compact camera sales. He told Bloomberg news agency: ‘The number of people taking snapshots is exploding by use of smartphones that sold 750 million or so last year and are still growing. The convergence of camera and mobile technology recently spawned the Samsung NX compact system camera, the first such device to feature an Android operating system – allowing photographers to edit images on its 4.8in (HD TFT Super Clear) LCD screen before using Android software applications to quickly upload them to Flickr, for example. Reportedly codenamed ‘EOS’ and ‘Elvis’, Nokia unveiled its new device at an event in New York City, trumpeting it as ‘zoom reinvented’. Last year, in an interview with Amateur Photographer, Nokia’s former imaging expert Damian Dinning said that tackling low light and camera shake would be key, as smartphones increasingly compete against traditional digital compact cameras. The PureView 808 incorporates a 1/1.2″-size, imaging sensor and a f/2.4 Carl Zeiss lens. Dinning said Nokia wanted to use pixels in ‘new and different ways’, following the release of the 808 PureView. Dinning claimed that a combination of imaging sensor, software algorithms and pixels can be used to further improve image quality. He stressed that Nokia wanted to move away from an industry ‘fixation’ with megapixels, focusing instead on areas such a high-quality electronic zooms, and how a device’s pixels are used. The PureView system deploys technology known as ‘oversampling’. ‘Pixel oversampling combines many pixels to create a single (super) pixel,’ stated a paper on PureView technology, co-written by Dinning who announced he was leaving Nokia at the end of last year. ‘When this happens, you keep virtually all the detail, but filter away visual noise from the image. At the time, Nokia hoped that photographers would use the 808 as a ‘second camera’. The 808 was one of the first Nokia phones to adopt the Windows Phone operating system. Nokia joined forces with Microsoft in February 2011 in a bid to raise its position in the smartphone market. It moved away from using the Symbian operating system, saying that its goal was to ‘establish a third ecosystem to rival [Apple] iOS and Android’. The firm, which started out as a riverside paper mill in south-west Finland more than 150 years ago, has a history of taking on new markets, having made products ranging from rubber boots and car tyres to TVs. In 1963 it developed radio telephones for the army, and launched its first car phone in 1982. By 2005, Nokia had sold its one billionth phone.